Dhankot Traders delivers wide assortment of Anchor Fasteners that are highly demanded by our customers due to its excellent properties and varied applications. Being one of the leading Distributors and Dealers of Anchor Fasteners, we only offer quality assured products in different sizes and dimensions, so as to guarantee the quality of products on certain level. These are mainly reckoned due to its extreme durability, custom-made sizes, standard designs, low price and many other features. Our unrivalled ranges of Anchor Fasteners are suitable in various industries that include textile, Automobile, Railways, Defense, Electrical & electronics, and much more. Manufactured using optimum raw materials, our fasteners are available in different types like Rawal, Pin (Zebra) Bullet type, Double-Ring, Fisher and J-Hook. 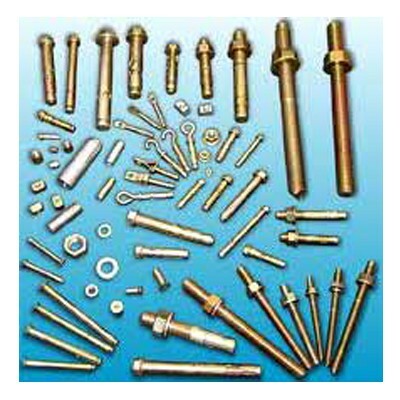 Thus, our clients have made us one of trustworthy Manufacturers, Exporters, and Wholesale Anchor Fasteners Suppliers from Chennai (Tamil Nadu) India. Available with us are different kinds of anchor fasteners that are shell anchor, shield anchor and sleeve anchor. Renowned for their durability and reliability, these have become a preferred choice. Anchor fasteners come in different sizes, materials and dimensions to match the emerging demands of the market. We also deal in offering premium quality Screw Bolts that are extensively used for fixing wash basins and EWC while constructing bathrooms. Manufactured using mild steel (nickel coated) and stainless steel, these are easily offered by us in bulk quantity.